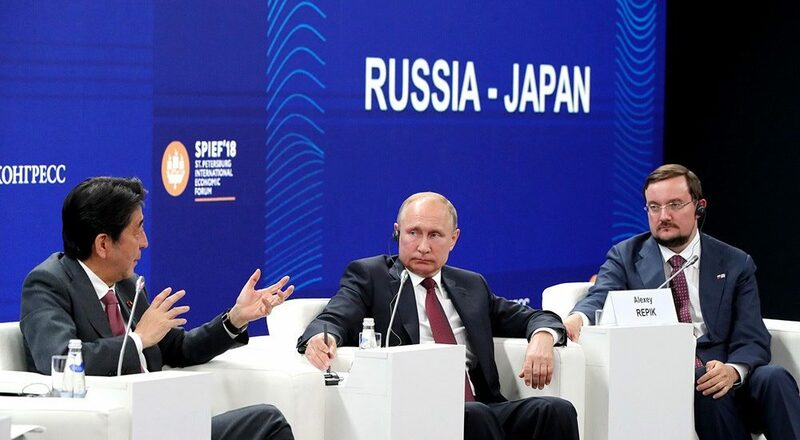 Putin and Abe took part in Russia-Japan business dialogue at SPIEF’18 – Company group "Taishi"
Igor Dyachenko, President of Taishi Group of Companies, took part in the SPIEF 2018. Russian President Vladimir Putin and Prime Minister of Japan Shinzo Abe joined the event following speeches by representatives of Russian and Japanese business community. Currently more than 100 agreements between companies of the two countries are on the stage of practical implementation. During the session, Russian and Japanese entrepreneurs spoke about their successes and existing barriers that prevent them from moving forward, identified new promising areas for cooperation, said Alexey Repik, president of the Delovaya Rossiya public organization. During the discussion, Vladimir Putin suggested considering the recognition of foreign certificates for pharmaceuticals to avoid excessive barriers for registration. The President stressed that development of pharmaceutical industry is very important for the country. Prime Minister of Japan Shinzo Abe spoke about cooperation between the two countries. Head of the Japanese government also stressed that implementation of the eight points plan remains top priority in Japanese-Russian economic relations. Shinzo Abe noted that investment climate in Russia is constantly improving but Japanese business community would like to improve the situation with obtaining various permits to conduct business in Russia. He expressed his confidence that further development of economic relations with Russia within the framework of the eight points plan will go more intensively.